I just finished reading this book and wrote a review of it on Goodreads. 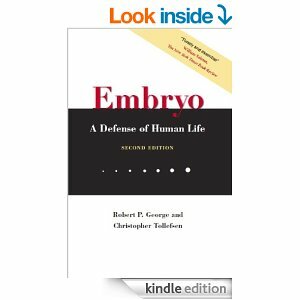 In short, how we view the personhood of the embryo affects our decisions from personal and private to the public and national arenas. Conclusion: human life begins at conception and is worthy of protection because if it’s not worthy of protection from that point, then it’s not worthy of protection at any point. Unless, of course, you can literally believe all that stuff about family reunions ‘on the further shore,’ pictured in entirely earthly terms. But that is all unscriptural, all out of bad hymns and lithographs. There’s not a word of it in the Bible. And it rings false. We know it couldn’t be like that. Reality never repeats. The exact same thing is never taken away and given back. How well the spiritualists bait their hook! ‘Things on this side are not so different after all.’ There are cigars in Heaven. For that is what we should all like. The happy past restored. And poor C. quotes to me. ‘Do not mourn like those that have no hope.’ It astonishes me, the way we are invited to apply to ourselves words so obviously addressed to our betters. What St. Paul says can comfort only those who love God better than the dead, and the dead better than themselves. If a mother is mourning not for what she has lost but for what her dead child has lost, it is a comfort to believe that the child has not lost the end for which it was created. And it is a comfort to believe that she herself, in losing her child or only natural happiness, has not lost a greater thing, that she may still hope to ‘glorify God and enjoy Him forever.’ A comfort to the God-aimed, eternal spirit within her. But not to her motherhood. The specifically maternal happiness must be written off. Never, in any place or time, will she have her son on her knees, or bathe him, or tell him a story, or plan for his future, or see her grandchild. Oh, what must the post-abortive woman be thinking when I walk up to her and say, “Be of good cheer, your sins are forgiven” and my implication: “Now stop grieving over your child and move on.” She smiles politely and nods, all the while thinking that I don’t understand. And I don’t, not exactly. I can empathize in part with my lost fatherhood, that’s something I’ll never experience with children of my own. But that’s not the same as lost motherhood, and that’s not the same as a woman who aborted her child. All I can offer is the Word of God and pray that the Comforter gives her the peace that surpasses all understanding. If you are experiencing the effects of an abortion decision in your past, please contact Option Line or call 800.712.HELP. Click here to read the next part of my thoughts on my observations from this book.